Very few things in photography are as tough as composing on an LCD in bright conditions. It's basically "guess and shoot." I've designed a simple solution using a cardboard jewelry box. It's easy to make, has adjustable depth, and can double as an accessory storage container. And the best part is, in bright conditions, it really works. I explain how this gem works in my latest article for the lynda.com Article Center titled, Photography Hacks: Make an LCD Shade, Battery Protector, and Lighting Field Kit. It's the first installment of a 3-part series that I'm authoring for the site. When it's not shading your LCD screen, the shade can serve as a handy accessory box. If you've got a little time to tinker this weekend, you might want to take a look at this post. I think you'll like what you end up with. The handsome, snap-focus Olympus ED 12mm f/2.0 lens is now available as standard issue in black. This all-metal wide-angle prime has an 85 degree angle of view, seven aperture blades, 8 groups/11 lenses, fast 2.0 maximum aperture, and weighs only 4.59 ounces. You can quickly switch from manual focus by pulling back the focusing ring until it "snaps" into place. I love this feature and use it often with my 17mm f/1.8 prime. By doing so, you can set a precise focusing distance. I've found this quite useful for astrophotography when I have to find the infinity setting in the dark. 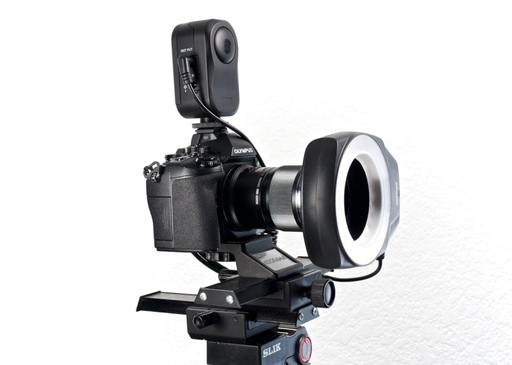 Olympus has also created a black version of the LH48 metal lens hood for the 12mm. I don't have pricing or release date yet for the lens hood, but I estimate that it will be in the $75 neighborhood. The 12mm f/2.0 lens is available for preorder now ($799). It should ship by early September. Also, you're curious about the new PEN E-PL7 "social photographer" camera ($599), then you should check-out Olympus Debuts the PEN E-PL7 Aimed at Social Media Photographers, published on c't Digital Photography Magazine. Even though the original attraction to mirrorless cameras was their high nimbleosity rating, over time, that's evolved into all around photographic capability. I have a few editorial assignments on the horizon, and I'm packing my Lowepro bag for these jobs. I thought you might be interested to see what's inside. 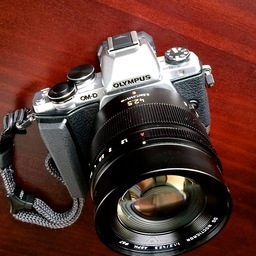 Olympus OM-D E-M1 - when it comes to professional work, this is the most capable mirrorless body in my arsenal. It is rugged, light, and very sophisticated. Olympus M.Zuiko Digital ED 75mm f/1.8 lens - this is the optic I reach for when I need a portrait with a soft background. At f/1.8, it is incredibly sharp where I focus, and creamy soft everywhere else. Olympus 9mm Fisheye body cap lens - I love having a fisheye in my kit, and this little gem hardly takes up any room. The pictures it produces, however, are grand indeed. Olympus 60mm Macro f/2.8 lens - not only does this prime optic bridge the gap between my 12-35mm zoom and 75mm portrait lens, but it has outstanding 1:1 close-up capability. The 60mm is very handy when you have to get really close. Lowepro Urban Reporter 150 - I've modified the interior of this bag to accommodate this kit, plus a flash and my iPad mini. It looks professional, yet is discreet. Great bag for city assignments. I'll usually pack the MeFOTO DayTrip tripod in my suitcase during flight. But it will fit in the Urban Reporter if I need to bring it out on location. That means, of course, I would have to leave another piece of equipment back in the hotel. 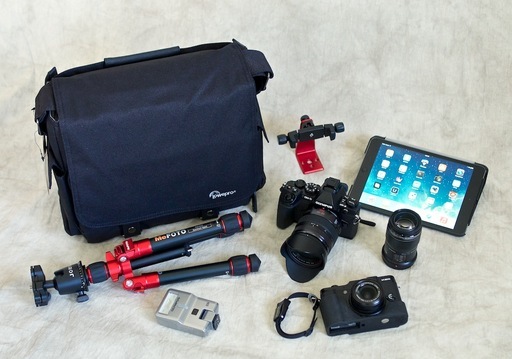 With this kit, I can photograph just about any editorial assignment that comes my way. Yet, it's very nimble, and quite honestly, a joy to use. This week on The Digital Story Photography Podcast: Silent Shutter, Huge Price Drop for the Panasonic GX7, Traveling with David Hobby, Luxurious Leica 42.5mm f/1.2 Lens for Micro Four Thirds - All of this and more on today's show with Derrick Story. Story #1 - Cactus Releases the V6 - The Cactus Wireless WRLS Flash Transceiver V6 is the world's first non-TTL wireless trigger that can control power of cross-brand system flashes of Canon, Nikon and Pentax. You can adjust power levels in 0.1EV increments for perfect control of light output. And the best part, they sell for $59 each. In other news, The Panasonic LUMIX DMC-GX7 Price Drop - The Micro Four Thirds GX7 is now available for $697 that's a huge price drop for its $999 list price. I'll be talking more about the GX7 for street shooting in the next story. And finally, Rumor: Zeiss Will Soon Announce the "Loxia" Lens Line for Full-Frame Mirrorless Systems (Sony Alpha) - All are designed by ZEISS itself, unlike the 55mm f/1.8 FE, which is a Sony product with ZEISS branding. All are said to be manual focus prime lenses, will feature a physical aperture ring and be made of high-quality materials. (Source: PetaPixel). 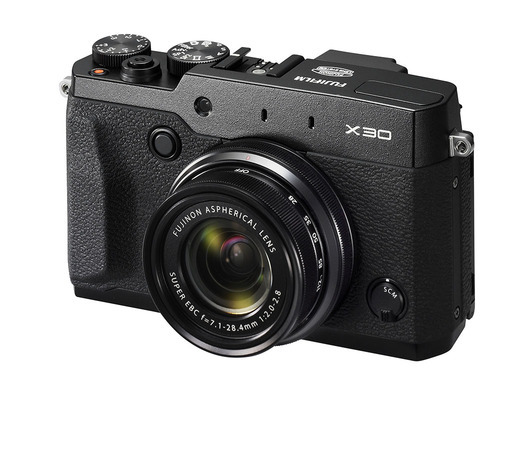 The new Fujifilm X30, along with its older siblings the X10, X20, X100 and X100S, feature a "silent shutter" option that's impressive. Story #3 - From the Screening Room - The Traveling Photographer: Fundamentals with David Hobby. David might surprise you with his approach to this title. It's not just about f/stops and lenses. He provides insights to traveling as a photographer while balancing the other aspects of your trip. You can watch David in action by visiting the TDS Screening Room at lynda.com/thedigitalstory. While you're there, you can start your 7 day free trial to watch other design, photography, and computing titles, plus every other topic in the library. Story #4 - I Got to Touch the Panasonic Lumix G Leica DG NOCTICRON 42.5mm/F1.2 lens for Micro Four Thirds. My friend and Lumix Luminary Joseph Linaschke stopped by the studio this morning with this optic in his bag of tricks. I immediately mounted it on my Olympus OM-D E-M10 to see how it would perform. Congratulations on your excellent work! Red River Paper just released RRP Luster Card Duo again. It's a double-sided luster paper pre-scored for cards. It is related to Arctic Polar Luster, but the surface is more pearlescent. You can find it here. The SizzlPix Challenge is Back! (for one month only). Each week the first 10 TheDigitalStory listeners/readers to order SizzlPix from their own favorite images will receive a mini-sample of each SizzlPix prior to production by return mail absolutely free! Just put the words "free sample first" and your mailing address in the comment space of SizzlPix's new simplified order form. In addition to subscribing in iTunes, you can also download the podcast file here (29 minutes). You can support this podcast by purchasing the TDS iPhone App for only $2.99 from the Apple App Store. Early start to the day. I received a text message at 6:19 AM from my friend and Lumix Luminary Joseph Linaschke. He was heading north from the Sonoma Racetrack and wanted to see if I was available for a coffee meeting. He had a bag full of Panasonic gear with him. You bet I was available. After catching up for a bit, Joseph pulled out his Panasonic LUMIX G Leica DG Nocticron 42.5mm f/1.2 ASPH Power OIS lens. What a beauty! I mounted the prime on my Olympus OM-D E-M10 and shot a few pictures. I wanted to test its "soft background" capability, so Joseph suggested we step outside for a quick portrait. Joseph Linaschke with Panasonic 42.5mm prime lens on an OM-D E-M10: ISO 100, f/1.2, 1/500th. Photo by Derrick Story. The lens was everything you'd expect from a premium optic. Focusing was swift and accurate. Design and build were outstanding. And image quality was top notch with beautiful softness in the background. Most photographers wouldn't expect these results from a Micro Four Thirds sensor. But yes, you can enjoy full frame quality from your compact Panasonic or Olympus body. The Nocticron 42.5mm has a click-stop aperture ring near the front of the barrel, and a switch for optical image stabilization on the side. Olympus shooters can leave the aperture ring set to "A," because the OM-D firmware doesn't acknowledge the click stops. (They're still fun to play with, however!) But the optical stabilization does work if you prefer to use that over the sensor-based stabilization on the OM-D. The nine circular diaphragm blades help create very smooth bokeh in the background. And the metal lens hood, which is very similar to the metal hood I have for the Olympus 75mm f/1.8, adds a nice finishing touch. The Leica Nocticron 42.5mm f/1.2 lens is a dangerous lens to test. After about 3 minutes, you'll be checking your credit card limit to see if it can accommodate another $1,600. When I decided to join Instagram, I wanted to be somewhere special. I made that decision two years ago, and the location was Maui. 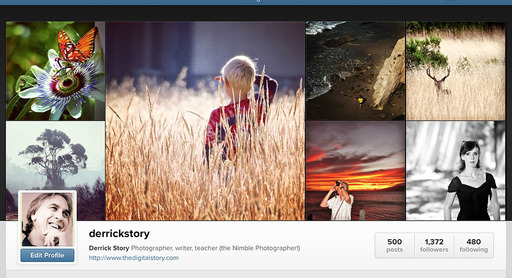 Today, I've published my 500th Instagram post. I chose an image from my stay in Hawaii in August 2012. I selected a colorful sunset image with a sailboat and light reflecting on the water. For some reason, that picture radiates the good feelings I have about this project. Instagram has had its share of controversy. But for me personally, it has helped me become a more creative photographer. Every day, I think about what would be a good post as I navigate my world at home, or while I'm on the road working. It keeps my gears turning. I follow a lot of shooters on Instagram. Some depend on their celebrity status, others are beautiful and capture selfies as the mainstay of their feed. But a lot of people are like me too: photographers who love taking pictures for the pure joy of it. And we have a place to celebrate our passion. That's what hooked me. The images on this feed are different than my work as a photographer for hire. Assignments tend to have restrictions. I need to produce images that match a description. Even my publishing on The Digital Story is illustrative. I'm creating photos to describe a product or technique. But when I press the shutter button for Instagram, it's just a picture. It could be anything in any style with any filter. It doesn't matter. Some images resonate and others don't. Like any photographer, I appreciate a "like." But I'm not thinking about that when I create the photograph. My thought is, "What can I do that's interesting?" And that's why I love Instagram. Not every tweet should include an image (thank goodness! ), but on occasion, a picture really helps tell the story. If you use iPhoto to organize your captures, then you might be interested to see just how easy it is to enhance your tweets. 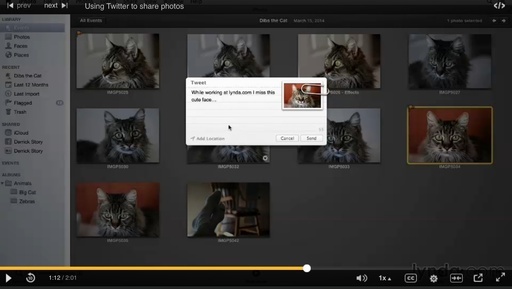 In my free training video, Using Twitter to Share Photos, I show you how to connect iPhoto to your Twitter account, then post tweets directly from the picture management application. Regardless of how you like to use iPhoto, I think you'll find many useful tips in Up and Running with iPhoto. This title is for the latest version of iPhoto that runs on Mac OS X Mavericks. This week on The Digital Story Photography Podcast: Off the Grid Photography (the Green Photographer), SizzlPix Award Winners, EISA Awards: the Best of the Best from Europe - All of this and more on today's show with Derrick Story. Story #1 - The Weekly Update: Sony a5100 First Impressions Review - "Based on my initial experiences with the a5100, it seems like a very compelling midrange ILC. For $699 with the 16-50mm power zoom lens, you're essentially getting an a6000 without an EVF and a few dials. If you don't mind losing that feature, you're getting what seems to be a lot of camera for $699 (with a 16-50mm lens)." (Source: DP Review. In other news, The European Imaging and Sound Association Awards 2013-14 include the Olympus OM-D E-M10 (Best Consumer Compact System Camera), FujiFilm X-T1 (Best Advanced Compact System Camera), and the Sony RX100 III (Best Compact Camera). You can see all of the winners at the EISA site. And finally, onOne Software is giving away Perfect Effects 8 ($79 value) in exchange for your email address and a free subscription to their Fotocommunity newsletter. You can take advantage of this offer at the onOne web site. 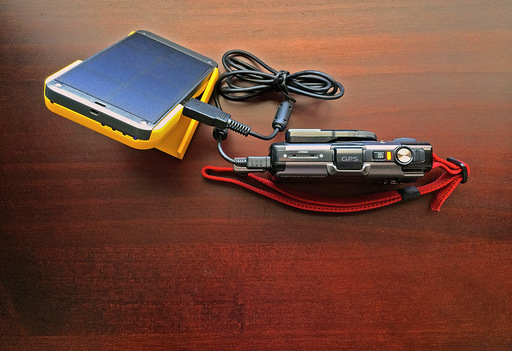 Olympus camera being charged via USB by a WakaWaka solar charger. Story #2 - Off the Grid Photography (The Green Photographer) - Our digital tools have made us dependent on Internet connectivity and power outlets. But if you wanted to get off the grid for a week or two, could you? Yes, and fairly easily. Because technology is advancing in renewable energy too. Here are a few of the items that I discuss in today's Green Photographer segment. The Levin Sol-Wing 13W Ultra-slim Highest Efficiency Solar Panel Portable Solar Charger ($69). Story #3 - From the Screening Room - GarageBand Essential Training with Garrick Chow. 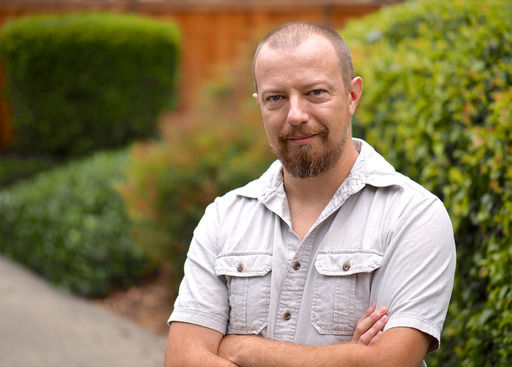 Garrick is one of the most season lynda trainers, and he specializes in Mac software titles. If you've wanted to learn GarageBand, but just found it a bit overwhelming, Garrick will break it down for you in digestible parts. You can watch Garrick in action by visiting the TDS Screening Room at lynda.com/thedigitalstory. While you're there, you can start your 7 day free trial to watch other design, photography, and computing titles, plus every other topic in the library. Visit the Red River Paper Card Shop. You can peruse top selling cards, order the card sample kit, and read tutorials on card printing. Save on Ground Shipping for Red River Paper. Use coupon code ground50c to receive a 50 percent discount on UPS ground shipping for Red River Paper. No minimum purchase required. Getting close doesn't have to mean going broke. 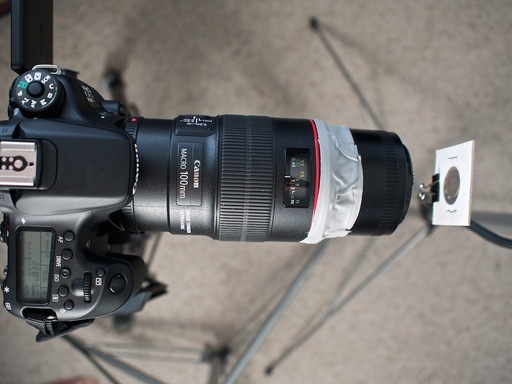 You can create professional macro images with a little ingenuity and tape... literally. In the article, Gaffer's Tape Plus Prime Equals Magnification Boost, I explain how you can attach a reversed 50mm lens to a telephoto or macro lens for a substantial increase in magnification. It's a very easy technique, and the image quality is excellent. In the article, Gearing Up for Macro, I show you how inexpensive accessories can enhance your capability and enjoyment when shooting close-ups. Gaffer's tape, LED lights, free iOS apps... all add up to big fun, not large charge balances. Take a closer look.